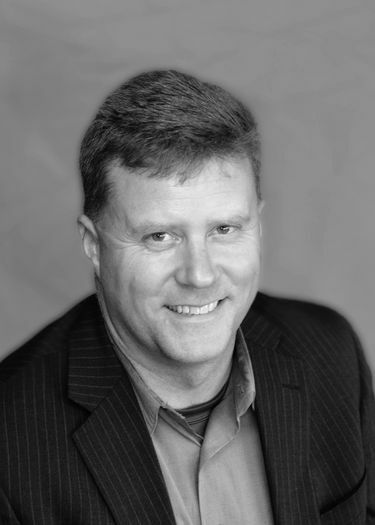 Is this guy a Washington state watchdog or a partisan annoyance? Activist Glen Morgan has been filing dozens of state campaign-finance complaints against Washington Democrats and others — 75 so far this year. And he’s got more planned. Meanwhile, state officials work to deal with it all. OLYMPIA — There’s something you should know about Glen Morgan, the serial filer of campaign-finance complaints aimed at Washington’s Democratic candidates and organizations. Morgan said he may have hundreds more campaign-finance complaints to add to the deluge he has filed against Democrats in the past year or so. They include allegations that candidates and campaigns have failed to correctly report debt and break down spending, Morgan said. Other possible complaints, he said, may allege that people have failed to properly fill out personal financial-disclosure statements. Those could go to the state Attorney General’s Office, or the Public Disclosure Commission (PDC). Or, in typical Glen Morgan fashion, they could be filed simultaneously to both agencies. His office sits in his home in Tenino, a tiny town about 15 miles south of Olympia. From there — and the occasional coffee shop — Morgan has launched a volley of campaign complaints. They can be seen, depending on one’s politics, as necessary watchdog actions against the Democrats, or as time-sucking, frivolous distractions by a partisan rival. Those recently caught in the crosshairs of Morgan’s complaints include the King County Democrats and state House Speaker Frank Chopp, D-Seattle. Morgan argues that his efforts keep government honest and highlight quirks in state disclosure laws he believes need changing. Republicans, especially at the county level, he said, have dropped the ball in filing complaints, losing out on a way to hold Democrats accountable. He also sees his actions as pushback against agencies he considers biased against Republicans. That refrain rippled through the 2016 election cycle, when the Washington State Republican Party called for the resignation of the PDC’s executive director at the time, Evelyn Lopez, claiming she aided Democrats. “It creates a scenario where people will believe they’re biased, because it depends on who the director is that day,” said Morgan. Meanwhile, state officials work to deal with it all. 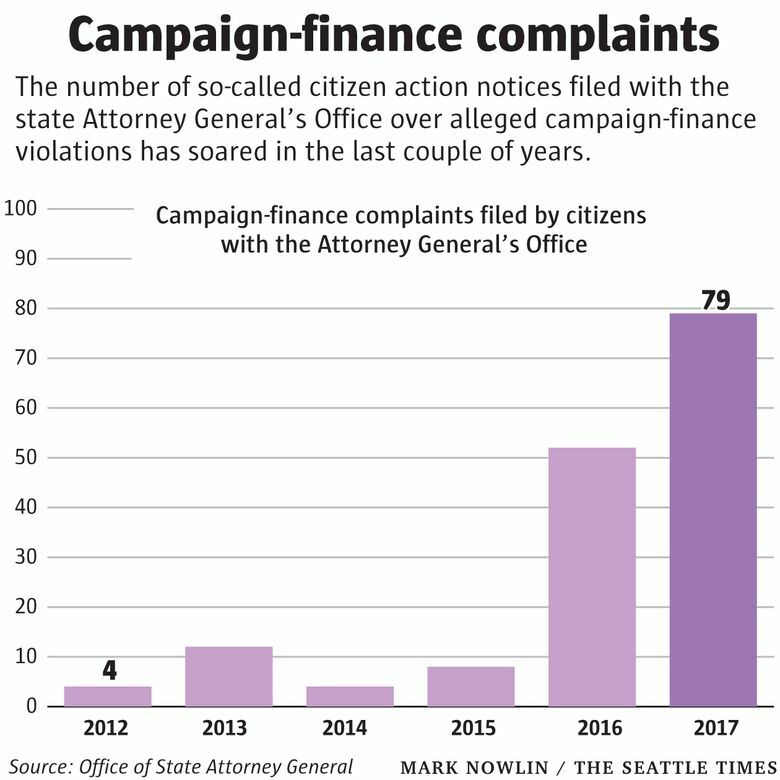 According to the Attorney General’s Office, between 2012 and 2015, the number of so-called citizen-action complaints bumped along at a handful per year — a dozen at most. In 2016, when Morgan began filing at high volume, the Attorney General’s Office received 52 complaints — 19 from him. As of May 23, the office has recorded 79 complaints for this year. Morgan filed 75 of those. Bailey Stober, chair of the King County Democrats, describes Morgan’s one-sided stream of complaints as mostly frivolous and predicts most will be dismissed. Still, following a Morgan complaint, the Attorney General’s Office has sued the King County Democrats. Attorney General Bob Ferguson acknowledged Morgan’s right to file as many complaints as he would like. “He’s entitled to do that, and I respect that,” said Ferguson. The attorney general lists recent successful campaign-finance actions against the Washington State Labor Council, and Service Employees International Union chapters 925 and 775. He also notes the cases involving Chopp and the King County Democrats. Ferguson last year created a special campaign-finance unit inside the Attorney General’s Office. It was a move to bolster enforcement for Washington’s campaign-finance laws, which sprung out of a 1972 ballot measure approved by voters. As a check against power, the laws allows ordinary people to file complaints. Dealing with smaller complaints such as Morgan’s wasn’t what Ferguson had in mind. “I created a unit for a specific reason, and that is to handle more complex campaign-finance cases,” he said. As an example, Ferguson cited the record-setting $18 million penalty imposed last year against the Grocery Manufacturers Association. That judgment came after the group was found to have concealed millions of dollars in campaign spending in a fight over a 2013 food-labeling ballot measure. Ferguson won’t say how much time and resources the new unit — which includes two attorneys, a legal assistant, a paralegal and an investigator — has devoted to Morgan’s complaints. But, given the increase in complaints, “My team and I are having conversations about the best use of our resources,” Ferguson said. After it receives a citizen-action complaint, the Attorney General’s Office has 45 days to review the allegations and decide whether to take action. If the office doesn’t act, the citizen can ultimately bring a lawsuit. Morgan often files duplicate — and additional — complaints with the PDC. The agency can send warning letters, issue penalties, or, in more severe cases, refer allegations to the Attorney General’s Office. In just the past week, Morgan filed complaints to the PDC regarding Manka Dhingra, the Democratic candidate in this year’s high-stakes, Redmond-area state Senate election, as well as Kitsap County and the Pierce County Democrats. The spike in complaints has strained the PDC, Lopez said in late April, shortly before she left the position. She is now running for mayor of Tacoma, a nonpartisan office. Morgan’s allegations sometimes target technicalities in the law, such as conflicting disclosure requirements for candidates as they file for office. Other times, the complaints highlight campaigns that are late on reporting. Those issues can be serious, according to Lopez, or they can be small problems that campaigns voluntarily move to correct. “The last thing we want to do is to discourage people from self-correcting,” Lopez said. Morgan also sees complaints get tossed out. His complaint filed in January against state Sen. Kevin Ranker made a dozen different campaign-finance allegations against the Democrat from Orcas Island. A PDC review found the allegations didn’t warrant a formal investigation or enforcement actions against Ranker. He said he hopes his complaints will generate data to gauge whether violations are enforced consistently, and how penalties compare. That could be useful for efforts to streamline campaign-finance laws, which Morgan hopes lawmakers in Olympia will work on next year. Sen. Mark Miloscia, R-Federal Way and chair of the Senate State Government Committee, said he has spoken with Morgan and is already on board. “Right now, under the current situation, it’s used willy-nilly by both sides,” said Miloscia, who has previously co-sponsored bipartisan campaign-reform proposals. “There’s entirely too many complaints being done by both sides, using the PDC as a hammer,” added Miloscia. The Senate plans to hold a committee session on the issue. In response to Morgan’s complaint, Chopp, the leader of the Democratic House, wound up agreeing to pay about $1,700 in fines. Some of that penalty was for the late reporting of some campaign donations, which “the campaign self-corrected within a reasonable amount of time, shortly after the issue was discovered,” according to Chopp’s response to the complaint. The Attorney General’s Office ultimately found that most of Morgan’s allegations against Chopp weren’t violations of the law or couldn’t be substantiated. Chopp said he is willing to review campaign-disclosure laws — but only if the PDC recommends it. Morgan said he plans to file at least another six months’ worth of complaints. And if his crusade doesn’t immediately pan out?